If you have any stories, memories or pictures linked to your days at Windsor Castle this is the page for you. DOWNLOAD TIP FOR NEW VISITORS.... ON YOUR FIRST VISIT BE PATIENT AND LET THE WHOLE PAGE DOWNLOAD COMPLETELY. THE PAGE WILL BE 'CACHED' ON YOUR PC AND ON SUBSEQUENT VISITS THE IMAGES SHOULD DOWNLOAD MORE QUICKLY. 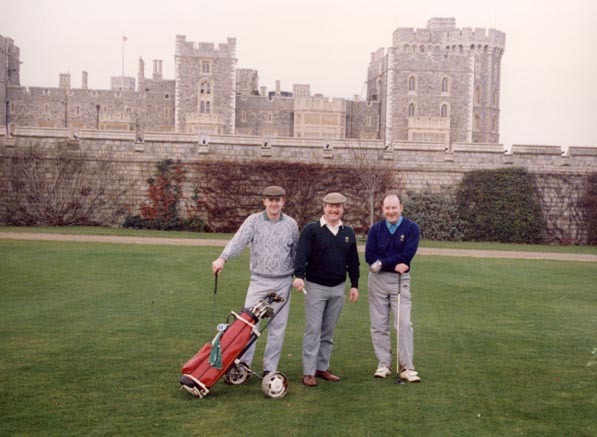 L-R PC Jon Cryle, PC Stanley Highmore and 'Dave' H.M. Queen Elizabeth II Ex Head Chauffeur on 1st Tee Royal Houshold Golf Club, Windsor Castle, Berkshire. Below: Henry VIII Gate, Windsor Castle. 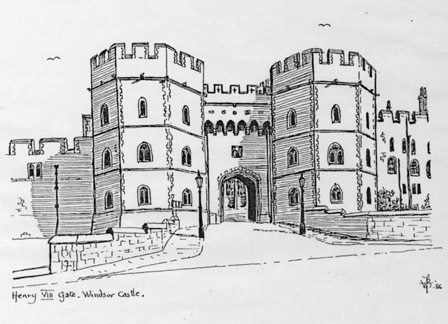 This excellent pen and ink drawing of Henry VIII Gate at Windsor Castle was drawn by PC. Winston Fane-Bailey in 1986.PC. Fane-Bailey was a serving Officer at Windsor Castle at the time. 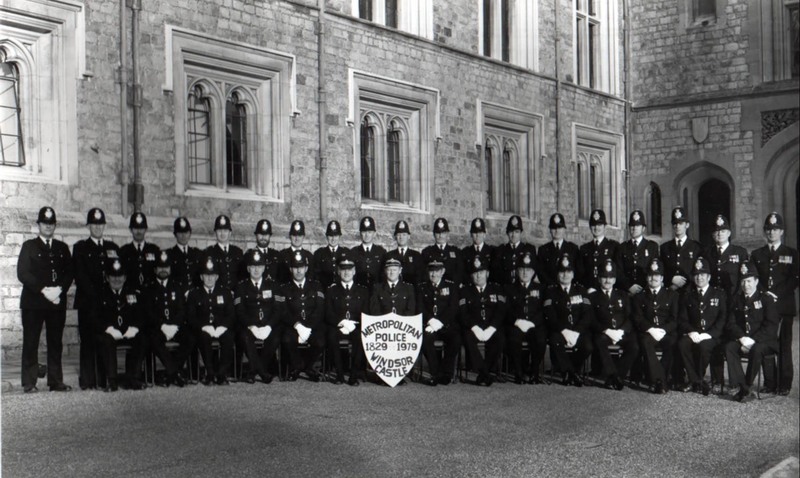 I forward a photograph of Windsor Castle Detachment taken in 1979 to commemorate the 150th anniversary of The Met. Police. My Name is Roy Smith, I was the Chief Inspector i/c at the time and retired in March 1981. I had previously served at Cannon Row in 1965 and 1966 before going to The Castle. My Warrant Number was 136640 I now live in Maidenhead. E Mail address roy.smith6@virgin.net and would be pleased to hear from anyone who wishes to contact. I am in contact with Ex Sgt. Bob Wilson ( Duty Sgt) at AD from 1957 to 1982. Also Mick Green ex Sgt at AD and Later Ch.Inspector at BP.Also Don Bourn Ex PC from the Castle who lives in The States. I am in contact with PC Stan Highmore at The Castle and supply names of the "old uns" for a Bi Annual reunion. The following is a list of the officers in the photograph as far as my memory serves me, bearing in mind it was taken 23 years ago. From left to right back row. P.C's Jeffrey, Bourn,Bell, Shaddick, Way, Johnson,Jeffreys,Dyer,(not sure) (not sure)Jephcote, Grigson, Woods,Lysek,( Not sure)Lane, Routledge,Scarlett. Front Row left to right. Pc,s Ottewill,Ward, Beasley(deceased) Sgt.s Dumain(Deceased) and Raine.Inspector Miller. Ch.Supt( not sure) myself,Sgst,s Reid, Barringer and Holt(not sure) P.C,s Bryant, Shelley and Morrison. Hope this is of interest to some who visit the site. 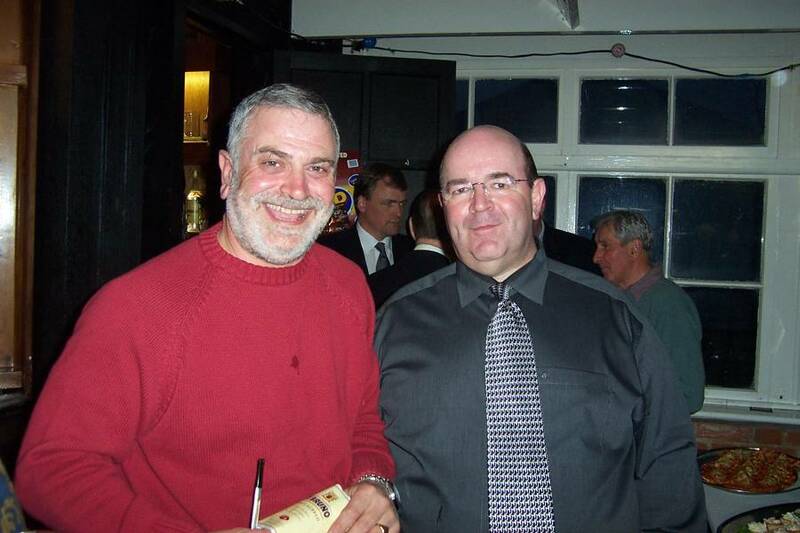 The photograph below was taken at The Cricket Club, Windsor Castle on 19.4.02 at the retirement party of P.C. Harry Chappel after 35 years service. It shows Harry (On Right) and Ex Pc Barry Ward. The Party was well attended I should think about 200 persons present, unfortunately as I have been out of the job so long I knew just about a dozen or so. Warrant Number 136640. Ex. Ch. Insp.